Infant mortality and mass incarceration are major issues affecting the black community. But while they are often thought of and dealt with on separate tracks, structural racism firmly connects these critical issues. Structural racism exposes black women to distinct stressors—such as contact with the criminal justice system—that ultimately undermine their health and the health of their children. Today, infants born to black mothers die at twice the rate as those born to white mothers.1 This horrific disparity cannot be fully explained by differences in income, education, or even health care; evidence suggests that cumulative stress from generations of structural racism is driving this epidemic.2 To combat this persistent problem, lawmakers must attack structural racism in all its forms—including mass incarceration. Based off new analysis and existing evidence, the Center for American Progress believes the toxic stress from contact with the criminal justice system has contributed to the disparity in rates of black and white infant mortality.11 In fact, experts estimate that infant mortality rates today would be 7.8 percent lower and that disparities between black and white women would be 15 percent smaller if incarceration rates had remained at 1970s levels.12 Targeted interventions are necessary to close the gap and bring the United States up to par with other developed countries. This issue brief presents a new CAP analysis and summarizes existing research to detail the effects of mass incarceration on black women and children. In particular, it highlights how black women’s heightened contact with the criminal justice system leads to increased stress and disparities in health and infant mortality. Like most analyses, some data limitations exist and are detailed at the end of the brief. Black women and their families, especially within younger generations, are also more likely than their white counterparts to have indirect contact with the criminal justice system through the incarceration of a household member. 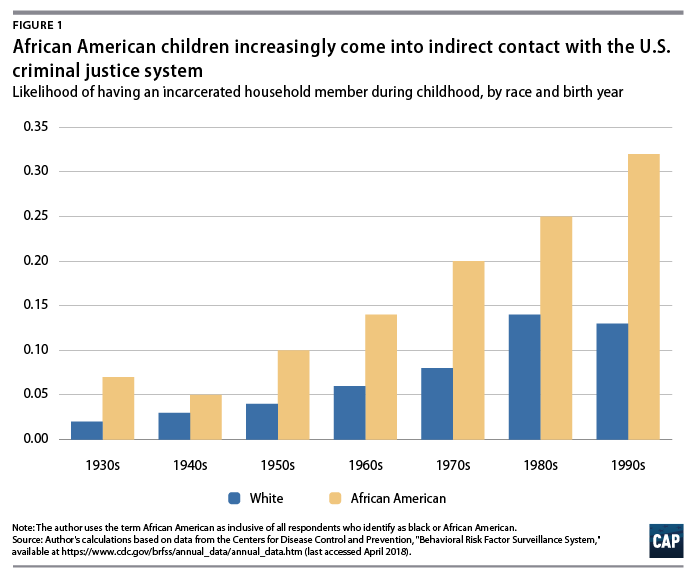 According to new CAP analysis of data from nine states, African American children across generations have had more than twice the odds of having an incarcerated household member as white children.15 This is true even after controlling for income level; geography; and family history of addiction, mental illness, and abuse. The data also reveal that younger generations are at greater risk, with 27.4 percent of black Millennials having indirect contact during childhood, compared with 10.7 percent of black Baby Boomers. A related CAP analysis found that racial disparities in indirect contact with the criminal justice system persist long after childhood. In fact, more than 1 in 4 African American baby Boomers—26.4 percent—report having an immediate family member incarcerated at some point in their lifetime, compared with just 15.1 percent of white Baby Boomers.16 Large disparities exist even after controlling for other important variables, such as income and education. As Millennials and post-Millennials have come—or are coming—of age during a period of mass incarceration, they will likely report even higher rates of contact with the system during their lifetimes. Furthermore, the vast majority of incarcerated women are also mothers—mostly to young children.20 Prior to incarceration, most of these women were the primary caretakers of their children.21 But half are confined in facilities located more than 100 miles from their families, and more than one-third (38 percent) will not see their children even once while incarcerated.22 Lack of regular contact with their children heightens stress levels among incarcerated mothers.23 To make matters worse, many siblings are split up when a mother is imprisoned.24 When this occurs, incarcerated mothers are four times more likely to experience high levels of maternal strain—or significant stress from feeling like they are not fulfilling their obligations as a mother.25 In addition, if children are placed in foster care, incarcerated mothers risk never getting them back, even if they are able to demonstrate the ability to care for them upon release.26 Black mothers are already far more likely to report depression than the general population.27 These stressors only exacerbate this persistent problem. These traumatic experiences produce mental and physical scars that undermine the long-term health and well-being of women and their infants.35 As discussed above, black women are overrepresented in the criminal justice system and thus at heightened risk of exposure to these unique stressors. This reality contributes to health disparities between African American women and white women. Indirect contact with the system—such as having an incarcerated loved one—is another traumatic experience that is more likely to affect black women than white women. While indirect contact is associated with worse mental health outcomes regardless of race—and Iowa is not necessarily demographically representative of the country, meaning broad conclusions should not be drawn from one sample—the data do provide insight into a state with some of the starkest racial disparities in incarceration. Black Iowans constitute just 4 percent of the state population but 25 percent of its prison population and are 11 times more likely to be imprisoned than white Iowans. 39 Ultimately, this exposure during childhood puts black Iowans at greater risk of adverse mental health outcomes in adulthood. Infants born to black mothers are dying at high rates. According to the Centers for Disease Control and Prevention (CDC), they are more than twice as likely to die as infants born to white mothers.46 In seeking to explain this disparity, researchers have discovered that protective factors such as education, income, and health care reduce infant mortality rates for many women but do not necessarily reduce the risks for black women. Achieving postsecondary education, for example, decreases the risk of infant mortality for white women by 20 percent.47 For black women, however, the same accomplishment has no effect on risk of infant mortality.48 And while increasing income in adulthood decreases the risk of infant mortality for white women who experienced childhood poverty by 50 percent,49 the same experience did not have a statistically significant effect for black women.50 The National Institutes of Health recommend early and regular prenatal care to improve chances of a healthy pregnancy.51 But black women who receive early and regular prenatal care are still at greater risk of infant mortality than white women who receive no prenatal care.52 While well-known protective factors may help some women, the evidence is clear—a different type of intervention is needed to help black women and their infants. Existing research confirms this relationship. 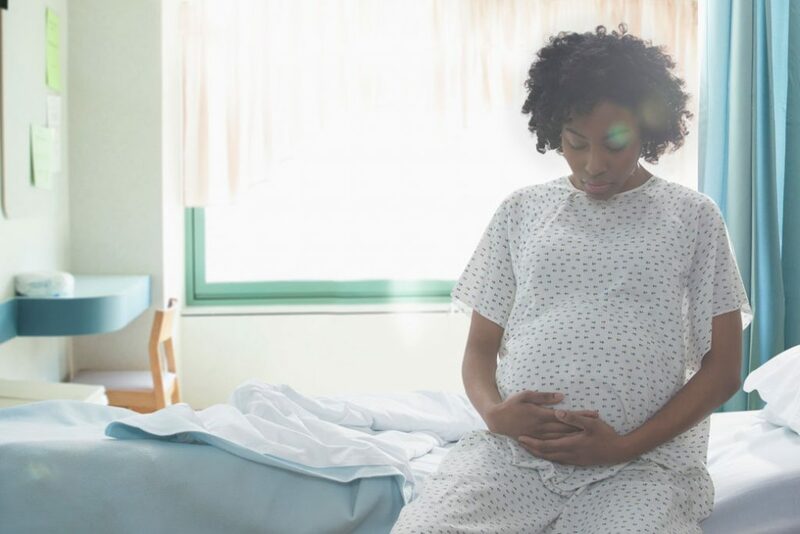 Incarceration is associated with higher odds of low birth weight, preterm birth, and infant mortality.59 Mass incarceration has exposed millions of black women to dangerous stressors that threaten their health and the lives of their offspring. Lawmakers must act to put an end to this persistent form of structural racism. The United States holds the worst record for infant mortality in the developed world and broad, universal approaches are unlikely to succeed in addressing this persistent problem. Instead, lawmakers should approach this problem using the “targeted universalism” equity framework.60 Developed at the Haas Institute at the University of California, Berkeley, this framework focuses on applying targeted interventions to meet universal goals. To achieve the universal goal of a lower U.S. infant mortality rate, lawmakers must target policies and resources toward specifically addressing black infant mortality. As perhaps the United States’ clearest manifestation of structural racism, the criminal justice system is an important place to start. To determine familial connectedness to the criminal justice system, the authors utilized two data sources. The first was the Behavioral Risk Factor Surveillance System (BRFSS) from the Centers for Disease Control and Prevention (CDC). For this analysis, the authors constrained the sample to U.S. residents who answered questions in the Adverse Childhood Experiences module between 2011 and 2013—a sample size of 81,280. The authors then used this module to create several models studying the relationship between race, familial incarceration during childhood, and mental health in adulthood. In studying this relationship, the authors controlled for income level during adulthood, geography, and ten other CDC-designated adverse childhood experiences. The authors included covariates for educational attainment, as well as behaviors such as smoking and drinking heavily, in the analysis of mental health outcomes in adulthood. The second data set analyzed was based on the AP-NORC Center’s 2017 Phasing Into Retirement survey of Americans over age 50—which has a sample size of 1,683. The authors used this data set to study the relationship between race and the likelihood of familial incarceration during an individual’s lifetime. In studying this relationship, the authors controlled for income level during adulthood and educational attainment. The authors also used this data set to explore financial support of family members who experience incarceration. The authors made several assumptions when analyzing the BRFSS and AP-NORC data. First, they interpreted a “yes” response to the following BRFSS question as reporting that an immediate family member was incarcerated during the respondent’s childhood: “Looking back before you were 18 years of age … Did you live with anyone who served time or was sentenced to serve time in a prison, jail, or other correctional facility?” The author recognizes that not all individuals live with immediate family members during childhood and accepts this as a limitation of the analysis. The primary limitation of this study is the availability and reliability of the data collected for analysis. First, the CDC’s BRFSS only contains data on Adverse Childhood Experiences for 9 states—Iowa, Minnesota, Montana, North Carolina, Oklahoma, Tennessee, Vermont, Washington, and Wisconsin. These states are geographically and demographically diverse and produce a sample size of 81,280. Still, readers should use caution when drawing national conclusions due to the possibility that including additional states would have a statistically significant effect on the analysis. This analysis is also limited by the lack of BRFSS data on inflation adjusted household income during childhood. This is important because the primary variable being tested is familial incarceration during childhood. It is possible that including a covariate for childhood income would have a significant effect on the relationship between race and the likelihood of experiencing a childhood familial incarceration (CFI). Further, childhood income could affect the relationship between experiencing a CFI and reporting higher rates of nervousness and deep depression in adulthood. The authors justify the use of an adult household income variable as a control due to the close correlation between childhood and adult household income. Finally, omitted variables bias warrants caution here. BRFSS data do not contain data on the specific charges levied against the incarcerated family member, such as domestic violence. A relationship exists between CFI and adverse mental health outcomes even after controlling for abuse, substance use disorder, and other adverse childhood experiences. Still, it is possible that the underlying crime that led to the familial incarceration could be the true source of adverse mental health outcomes for some individuals in the BRFSS. Connor Maxwell is the research associate for the Progress 2050 team at the Center for American Progress. Danyelle Solomon is the senior director for the Progress 2050 team at the Center.